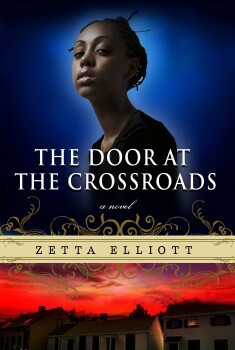 The Door at the Crossroads by Zetta Elliott was one of the Cybils YA Speculative Fiction finalists this year. Though it's technically science fiction/fantasy (not sure where time travel comes down), it's a good read to consider for Black History Month because it's time travel. Its teenage African American and Jamaican main characters are transported back to the American Civil War. Genna ends up in Weeksville, a free black community in Brooklyn. (I'd never heard of Weeksville, but it sounds pretty impressive.) Poor Judah, however, ends up in a nightmarish situation, enslaved in the south. Genna moves about in time a bit, getting back to 2001-era Brooklyn. But it's the historical work in Door at the Crossroads that's really impressive. Judah's story in the south is gripping, and the material on Weeksville left me wanting to know more. The book is a sequel, and readers might want to read the first book, A Wish After Midnight, before starting on Crossroads. The second book ends with a cliffhanger, suggesting another book is planned. Author Zetta Elliott was interviewed earlier this month at Cynsations about one of her most recent books, The Ghosts in the Castle, and being a hybrid author, meaning she's book traditionally and self-published. Also check out her lengthy list of essays, many of which are available on-line.